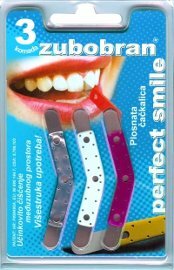 ZUBOBRAN® is the registered trade mark of an invention resulting from several years research of interdental cleaning at the private dental practice of Dr. Višnja Turjak. It is registered under the title FLAT INTERDENTAL SPACE CLEANER. Interdental spaces are not easily accessible to a toothbrush and therefore these places are the most common area of tooth decay and concealed inflammation of the gums. ZUBOBRAN® is very efficient, easy to use, and very helpful in the prevention of tooth decay and periodontal diseases. It is made in a combination of plastic and stainless steel. The central HOLDER reinforced with plastic is available in 6 colors: white, yellow, blue, green, violet and red. The FUNCTIONAL PARTS are flat and very thin – 0,035mm, made of high quality steal with exceptional flexibility and strength. It’s shape and rounded edges enable easy sliding between the teeth.